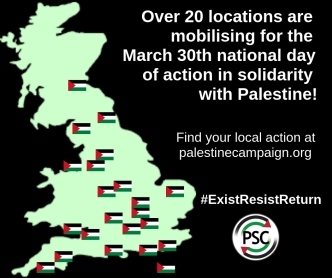 A reminder of this Saturday's International Day Of Action to commemorate the anniversary of the start of the Great March of Return. 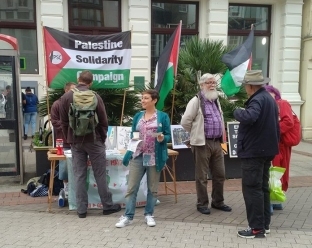 More than 25 towns and cities in the UK have organised solidarity events to show solidarity with the besieged people of Gaza. We plan to stage a number of events including a die-in. Interview with Palestinian poet and journalist Ahmed Abu Artema whose internet posts started the movement: Protest founder Ahmed Abu Artema discusses building a non-violent movement. Interview with the mother of 21 year old medic Razan al-Najjar who was shot by an Israeli sniper: A year on from the Great March of Return I still mourn my daughter Razan, killed in cold blood. We're hosting an informal get together on Tuesday 2nd April.